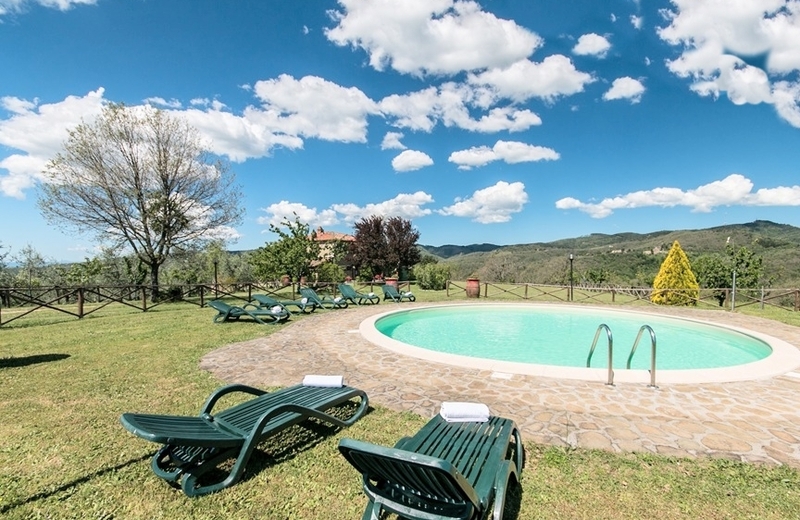 Farmhouse with pool, refurbished in 2006, close to town but surrounded by the peace and quiet of the Umbrian countryside. Olives, orchard. Great rental income. Farmhouse with pool, measuring approx. 285 sqm, fully refurbished in 2006 and located a short distance from the town but nevertheless surrounded by the peace and quiet of the Umbrian countryside. Its original features were maintained during the restoration, as one can see from the materials used. The facades are brick and stone, the typical staircase leads up to the loggia which looks out over the pool and the surrounding hills. Internally, the farmhouse has terracotta tiles and beamed ceilings. The windows and doors are wooden with internal shutters. The heating system is LPG. The infinity pool, which has a heating system and winter cover, is panoramic and has a large sun deck. Its shape is rectangular, with the exception of an extension to the side with steps. The garden that surrounds the farmhouse is well-kept, with various typical plants, about 60 olive trees and 15 fruit trees. A well provides water both to the farmhouse and the garden, where there are four irrigation points. There is a parking area for 6 cars. The property is fenced and there is a remote controlled entrance gate. A good rental property bringing in a substantial income. Type: Farmhouse with swimming pool, arranged over two levels; approx. 285 sqm. Garden: approx. 5000 sqm with orchard and 60 olive trees. Swimming pool: infinity. Panoramic and heated, size 8 m × 11 m.